The Woodpecker, it’s like SUPing on a kayak. It has the same curved bottom as a kayak and similar strong taper in the nose and tail. If you’re not ready for a serious challenge in balance, then it’s a good idea to hold off on this one. The Woodpecker is designed for one purpose: maximum speed. With one paddle you can feel the dynamics working to move you farther with less effort. And with its added nose rocker, none of that effort will be diminished in choppy conditions. It has an EPS core with no stringer to give it durability and flexibility. The deck glassing is a single layer of epoxy with a partial carbon fiber, and the bottom glassing is a double layer of epoxy and full layer of carbon fiber. The bottom also has added protection with a gloss coat and polished protective layer. This is the board for die-hard racing fans. Not only does the V-hull give it extra boost, it also has a dropped deck that displaces water to squeeze out every bit of speed. The advantage of The Woodpecker is its maneuverability. It’s not just a one trick horse built for speed. This feature is crucial for navigating over and down messy open water swells. As mentioned before, this board is 100% meant to be used for racing. Despite its significantly tapered nose (7.2”) and tail (2”), it has a volume of 286 liters, which allows for riders up to 270lbs. It comes in one color: brown. 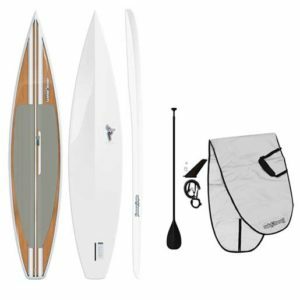 It comes with one single fin designed specifically for racing, a paddle and board bag. As the title says, it’s a tall can at 12’6”, with a weight of 33lbs and a width of 29 ½”. Speed. Maneuverability. Specifically designed for racing and navigating through chop without losing speed. 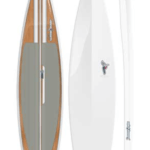 This board will improve your times and give you confidence to tackle some heavier conditions. If this is the only board you have and you want to just go out for a cruise or try catching some waves, it will fail you. The effort it takes to balance while going at cruising speed does not compliment the relaxed nature of going for a stroll on the water. 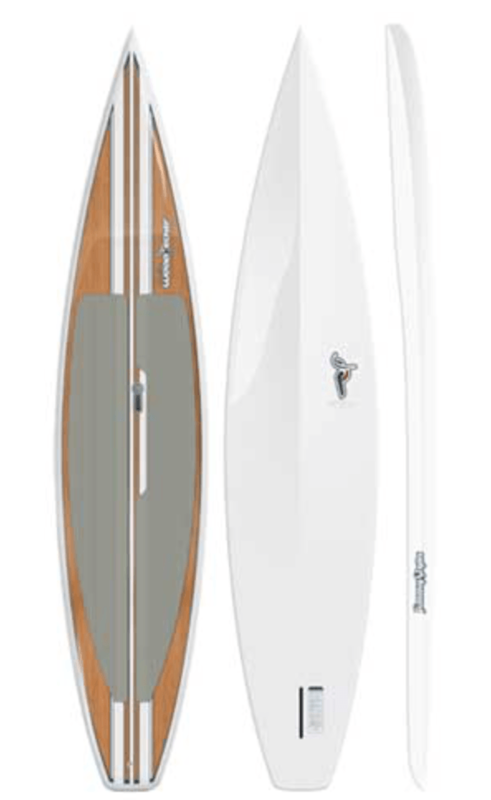 For catching waves, the deep V-hull bogs it down and makes turning in tight pockets on waves awkward and unstable. Use The Woodpecker for going far and going fast. It’s a good way to train for high levels of endurance. It’s ability to work well in chop makes it an ideal board to use for racing in almost any conditions, this means more time in the water and less time thinking about it. I’ve used the Woodpecker in 3 races so far and it is fast! I’ve previously used other race boards like the eradicator and think this one is really on the same level speed wise. It is unstable and you definitely need to be an advanced paddler but then again race boards are not known for their stability. The only thing I don’t like that much is the design. Different colors would be nice. Just purchased a woodpecker Racing Board took out for a three mile test run very fast definitely a advance board paddled well in the wind a very smooth downwind turn okay overall was Impressed I do like the looks of the board it came with bag ‘ leash ; and paddle will have to upgrade paddle but its okay got great deal on the board cant find anything near as good as this board for the money. Just bought the woodpecker today, I’m not so sure why the guy told me that the board has high stability, but your review did help me understand what’s the SUP board all about. I’m no pro but I’m excited to advance my skills using the board. I’m not going to give a rating since I haven’t tried it out yet.